I’ve always believed in Tim McCarver. He signed my autograph request back in the early 1970s. I’ve sat patiently listening to him do games on FOX, ignoring his numerous naysayers. However, I’m truly concerned about the former catcher. I wrote in 2011 about tough signers making the extra effort for Americans in our military. Well, I guess McCarver missed that feature. 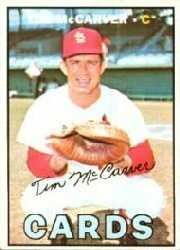 An unsigned card returned in a serviceman’s SASE was the icy response a letter to McCarver brought. Anyone knows a military APO address. The letter told who was asking for the autograph. Thank the man for his service, TM. Hall of Famer Whitey Ford did that just last week, never requesting the charitable donation he seeks per signature. Are you really getting that much mail, Mr. McCarver? Someone opened that envelope with your name on it. Someone took the time to use the postage on the SASE to NOT honor this man’s military sacrifice that he’s making for all of us. I’ve been watching McCarver explain baseball’s inner workings for decades. I’d love to see him analyze this. One “home” team I’ll always cheer! We’ve got it easy as collectors. Stamps, paper, envelopes, addresses? No problem. “I don’t see a problem with you writing about me on your blog. I have read some of your bloggings. I am currently deployed to Afghanistan. Since 2005 I have deployed three times to Iraq, once on the 24th Marine Expeditionary Unit (MEU) (I was on the USS Mesa Verde), and now Afghanistan. I collected cards as a child but got rid of all but my Nolan Ryan collection when I joined the Marine Corps. I started collecting again in 2006 after returning from my first deployment. I’m not sure why, but it may have had to do with the birth of my first child, Nathan, and the fact that I wanted something that I could pass on once he got older. I now have two boys, 5 and 2, so I guess I will have to split my collection between them. I started collecting autographs of athletes and celebrities at this same time. So far I have sent right at 1000 baseball requests out and about 500 requests to celebrities and other athletes. I have about a 40% return rate but that is rising as I have learned to research signing habits first. My special interests are the art type cards such as Allen & Ginter and Goodwin Champions. There is no prep work needed on the cards and they include other aspects of the collecting world besides just the big four sports. Although I have not sent any yet from out here, I will be very soon. I was concerned in the past about keeping the cards in good condition through the mail from here. I have gathered all of my “tools” already. I have been sent some cards by members of Sportscollectors.net and also ordered some from Blowoutcards.com, bought the envelopes and stamps, and am now just starting to write the letters to whom I am going to send. One of the first cards I will be sending is a Goodwin Champions Whitey Ford card of him in his military uniform. Hopefully he will be kind enough to sign for free as it is very hard to get cash to include as a donation over here. We use debit cards and cash cards here. I am having the returns sent to my house because I do not want any to get lost in the mail, so we will have to wait to see what my success rate is. As far as what fellow collectors could for other collectors who are deployed. They could always send us some cards or envelopes. I have had a couple people send me 3 or 4 packs which is just enough to help the craving. The biggest thing is not to forget that we are still out here doing our jobs and putting our lives on the line. The wars in Iraq and Afghanistan have been quite taxing on our military, our families and our country and sometimes people tend to forget that. So if you see a service member in uniform or know of one, let them know that you appreciate the sacrifices that they have made. It still feels good to hear it every now and then. I’ll be finding out more about how to get Tony and his fellow Marines some hobby care packages. I’ll share the how-to details here. They’re giving us their very best. In return, these all-star Americans deserve nothing less.